(Bloomberg) -- Traders in U.K. money markets have gotten so caught up with the increasingly dovish global narrative, they’ve left themselves vulnerable to a Brexit jolt. 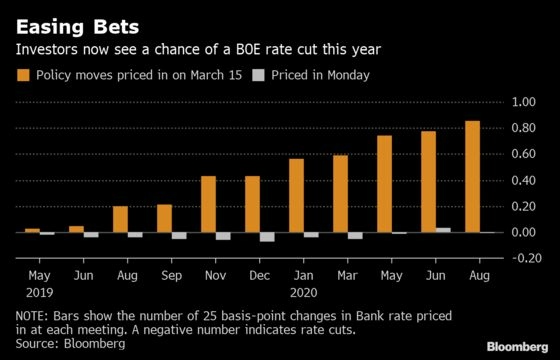 As traders adjust to global central banks becoming more pessimistic, market expectations for the path of Bank of England rates have flipped to favor a cut by March 2020, compared with an almost 50 percent chance of a hike by the end of 2019 earlier this month. This makes betting on higher rates using the money markets a good way to play a positive Brexit outcome, according to UBS Group AG. While warnings about the U.K. crashing out of the European Union with no deal become louder as the Brexit deadline looms, few strategists predict such an event, with an extension seen as more likely. That would ease pressure on the economy and potentially open the door for the BOE to tighten. Given the assumption of a rate rise is so low, that makes contracts based on the Sterling Overnight Index Average, or Sonia, which would profit from higher expectations of such an event look attractive, said John Wraith, head of U.K. macro rates strategy and economics at UBS. The current market pricing means an investor who buys a December 2019 or March 2020 contract will actually get paid to hold it, as it is below the BOE’s key rate of 0.75 percent. If the central bank hikes during that time, holders of the contract will make even more as the market pricing further out the curve is pushed up. If on the other hand, Britain tumbles out of Europe and policy makers cut rates, the trade will make a loss. But with the chance of Britain crashing out with no deal seen as unlikely, the risk-reward looks appealing at current levels, Wraith said.